Rediff.com's Prasanna D Zore and Photographer Reuben N V visit Gujarat's Sanand taluka, the recent hotspot for many high-profile investments: A fascinating story of unassuming crorepatis. Kanuji Ranchhodji Thakur, Natuji, Mahadevbhai, Sursanbhai Selabbhai, Ashrafbhai Pathan, Laxmibai Kantibhai Bharwad and Dashrathbhai Borad share unique destinies. Ordinary farmers all their lives, these simple villagers from Rasulpura and Bol villages of Gujarat's Sanand taluka in Ahmedabad district became millionaires overnight when Ratan Tata, chairman, Tata Motors, the company that makes passenger cars like the Indica and the Nano, decided to set up his dream project of Nano cars close to their tilled lands after the Tatas decided to leave West Bengal by the mercurial Mamata Banerjee and her Singur agitation. In 2010-11 the land that would not fetch even Rs 300,000 to Rs 500,000 per bigha (a unit to measure a land's size in this part of the world) commanded an astronomical Rs 28,53,000 for every bigha. (4.8 bighas=1 acre=0.0809 hectares. The Gujarat Industrial Development Corporation, the state's nodal authority that purchases land from farmers to develop industrial projects, made these villagers an offer they could not refuse. 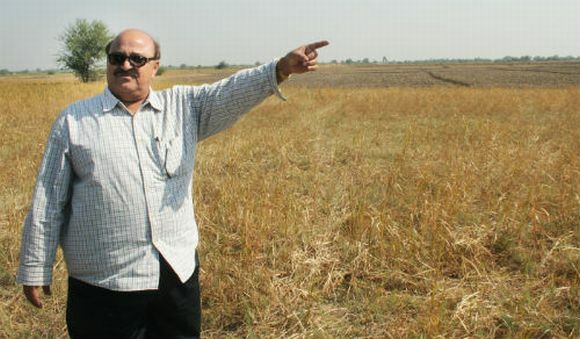 "I sold 150 bighas of my ancestral land to GIDC and got more than Rs 40 crore (Rs 400 million)," says Ashrafbhai, pointing towards a vast expanse of land in Rasulpura that once belonged to him. Ashrafbhai is the only villager who knows exactly how much land he sold to GIDC. The four other villagers Rediff.com spoke with could only give rough estimates of how much money they received for their land. Ashrafbhai's fellow villagers don't show such acumen when it comes to the size of their land holdings. 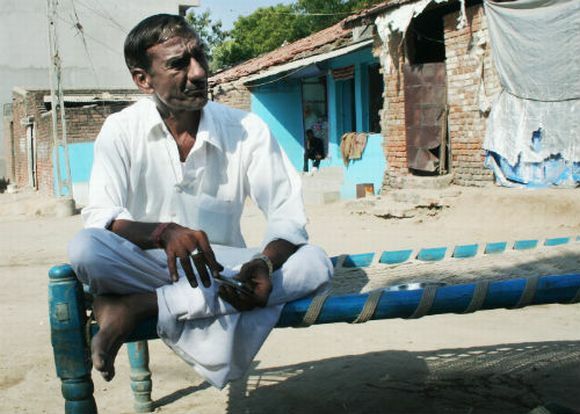 "I and my brother sold 25 to 30 bighas of land and were paid Rs 8 crore (Rs 80 million)," says 53-year-old Kanuji, a former sarpanch of Rasulpura. "25 bighas or 30 bighas?," this correspondent asks Kanuji in amazement. His friends help him do some reverse calculation to arrive at the number of bighas he sold to GIDC. "Haan, it must have been some 28 acres," says Kanuji, unable to hide his bluster. Natuji (Rs 6 crore/Rs 60 million along with his brother), Laxmibai (Rs 2.5 crore/Rs 25 million), Sursanbhai (Rs 5.5 crore/Rs 55 million) and Dashrathbhai (Rs 12 crore/Rs 120 million along with his brother) and Mahadevbhai (Rs 11.5 crore/Rs 115 million) all quote random figures when asked about the size of their landholding sold to GIDC. This is also the story of almost 100 families in Bol village and some 60 odd households in Rasulpura, says Dashrathbhai when asked about the number of crorepatis in these two villages. 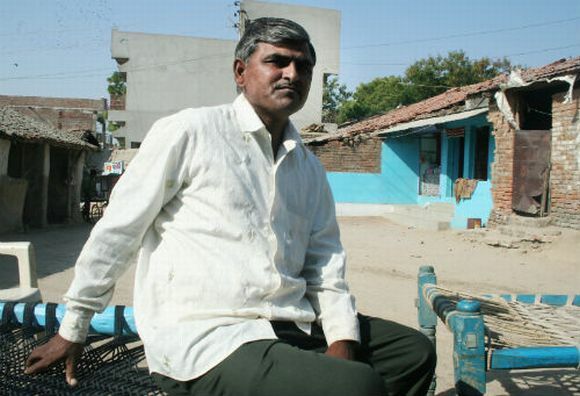 Image: Meet Kanuji, former sarpanch of Rasulpura, and a crorepati! Eexcept for Ashrafbhai and Dashrathbhai, most other farmers/landowners in these two villages eked out a hand-to-mouth existence, their sudden access to wealth has failed to change the lifestyles of these simple folk. "I haven't touched alcohol in the last six months," says Natuji, who says he drank before he became as a neo-crorepati. Dressed in a grey worn suit and doffing a smart Italian hat, Natuji excuses himself from the conversation on the pretext of gathering bamboo sticks or making arrangements for tea for his guests. Mahadevbhai, who lives three doors away from Kanuji in Rasulpura, which has 60 to 65 houses in all, assures Ashrafbhai and the others gathered around him that "I haven't touched daru (liquor) in the last month or so." "I had no future a couple of years ago. I was neck deep in debt," says Kanuji who had borrowed heavily from moneylenders to marry off his daughters. He also mortgaged some 20 bighas of his land to the moneylenders. "The interest just kept adding up. I couldn't pay the sahukar (moneylender) the principal amount and had to let go the land to clear my debts," he says. I quickly do a back of the envelope calculation: That is a loss of approximately Rs 5.7 crore/Rs 57 million for Mahadevbhai. 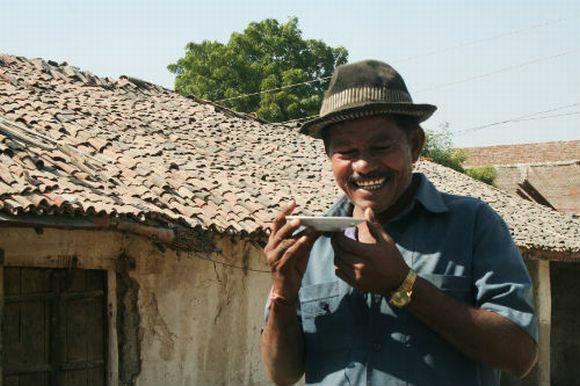 "The loss I suffered by selling my land to the sahukar is huge," says Kanuji, fidgeting with a basic Nokia mobile phone that betrays his sense of financial loss. "But I have made up for those losses," he says. Soon after Kanuji sold his remaining land to GIDC, he bought 20 bighas of land at Rs 5 lakh/Rs 500,000 per bigha in neighbouring Viramgam. "In about eight months, there is a buyer who is willing to pay me three times my investment," says Kanuji, who has bought 500 grams of gold for his daughters. The same pattern of conversation is echoed when you speak with Mahadevbhai, Laxmiben and Natuji. These villagers have bought huge tracts of arable, fertile, land in adjoining districts and villages at a pittance, which now command astronomical amounts of money as companies -- Indian and foreign -- make their way to Sanand. While Mahadevbhai owns a Tavera, Innova and Bolero, Laxmiben and Natuji have invested their bonanza in landholdings in adjacent villages. The lifestyles of these villagers has not changed. They continue to live simple lives, wear torn clothes, comfortable with the fact that they have millions of rupees in their bank accounts, which earn them handsome interest, with which they can confidently dream about their children's bright lives. 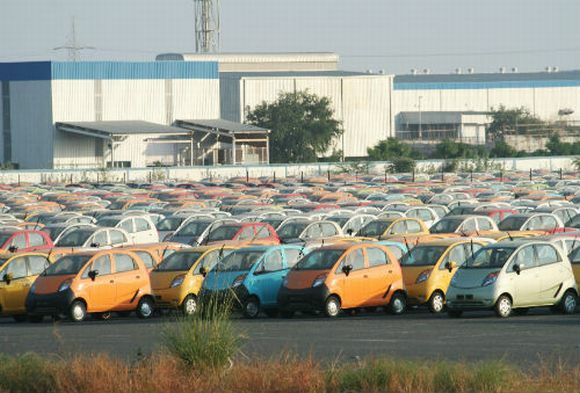 Colgate, Hitachi, Ford, Peugot are all located in Sanand, kissing distance from each other. But the villagers know it is the 'Neno' (that is they pronounce Ratan Tata's dream project) that transformed their lives. They know GIDC coordinated with hundreds of villagers in and around Sanand to buy their land, and they declare it is Chief Minister Narendra Modi who made them multi-millionaires overnight. The villagers of Rasulpura and Bol are in no hurry to forget Modi's presence in their good fortune when they cast their votes later this month. 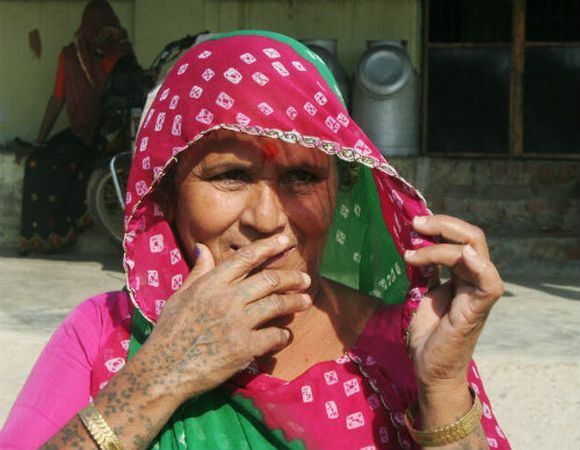 "Hu toh Narendrabhai nech vote karwani chhoo," Laxmiben tells Rediff.com, "Baki baddha gaya jhelum ni khadi ma (I am going to vote for Narendrabhai! Let everyone else drown in the Jhelum's waters)."